My tiny house has been getting a lot of wonderful attention over the past couple of weeks. It has been truly wonderful to have people coming out and visiting the construction site and getting the opportunity to geek out about tiny houses with them. I have also been contacted by a freelance journalist and found a Tiny House Movement group online. Very exciting times, and it’s a good thing too as I have not been able to move forward with the construction of my tiny house much over the past 3 weeks as I have been waiting for a plumber to rough in my propane lines before getting the house insulated. Two days ago, I was finally able to book the insulation! They are insulating as I write. Apparently insulating Tiny Refuge will take 2-3 hours, in theory. Lessons learned over the past three weeks: propane is one of the few codes here in Québec when it comes to how to build an RV. That code dictates that propane tanks be 10′ from any source of ignition and 3′ away from any opening into the house. So we had to move the electrical inlet and one of the exterior plugs. The exterior plug was easy to move. The electrical inlet proved to be far more challenging when one of the screws, that secures the 6 gauge wire that runs from the inlet to the electrical panel, broke. A trip to the hardware store proved only somewhat helpful, the right width of screw with the right threading was in the store attached to a stove plug outlet, unfortunately, the screw was too long. Time was spent grinding the screw down. While we attempted to reinstall the electrical inlet, another screw snapped in half. So we called it a day. I contacted the manufacturer, Marinco and they were amazing. They replaced the whole inlet and sent it off to me, it arrived within a week and we were able to install the new electrical inlet without any issues. While waiting for the electrical inlet to arrive, I contacted my neighbour, a plumber who had agreed to do my plumbing, about roughing in the propane. Unfortunately, he isn’t certified to do propane. He recommended a friend, who does a fair amount of propane installations, residential and commercial, and I contacted him. Long story short it took three weeks to discover that the propane should actually be done after the insulation and be installed under the trailer. That came to light Tuesday, and right now the interior of my tiny house is getting sprayed in WALLTITE closed cell spray foam insulation, which happens to be purple. Walltite is considered an ecological choice for spray foam, it’s plastic based (recycled plastic) and is also low in VOCs after the first hour of installation. Installers have to be certified by the manufacturer and take a course in order to be allowed to install it. From what I have read, the effectiveness of spray foam insulation depends a fair amount on how well it is installed. 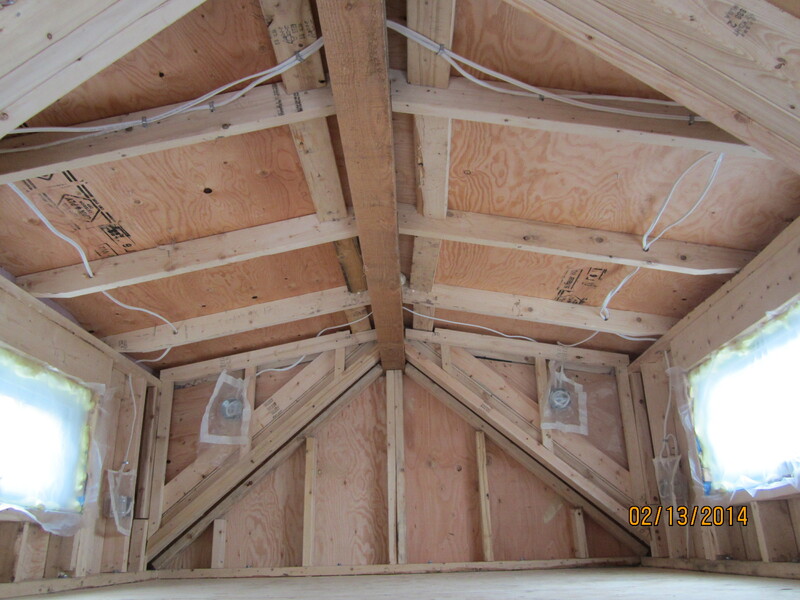 I have gone with spray foam insulation because it packs one of the best R-values per inch. Vacuum insulated panels (VIPs) have an amazing R-value, R29 per ½”, but if they are perforated in any way they lose their R-value completely. They are also not readily available. If I were building a house on a foundation, without size restrictions, I would still build tiny, but my walls would be thicker so that I could get a good R-value with something like wool insulation. Unfortunately, to heat my house throughout the winter in this climate an R-value of R13 or R18 will take a more resources. As a wood stove is a bit touchy in Montreal, I am heating with propane, which isn’t the most sustainable choice, and as such, I want to use as little propane as I can. A view of the whole wall ready for spray foam. You can also see the box built around the wheel well. 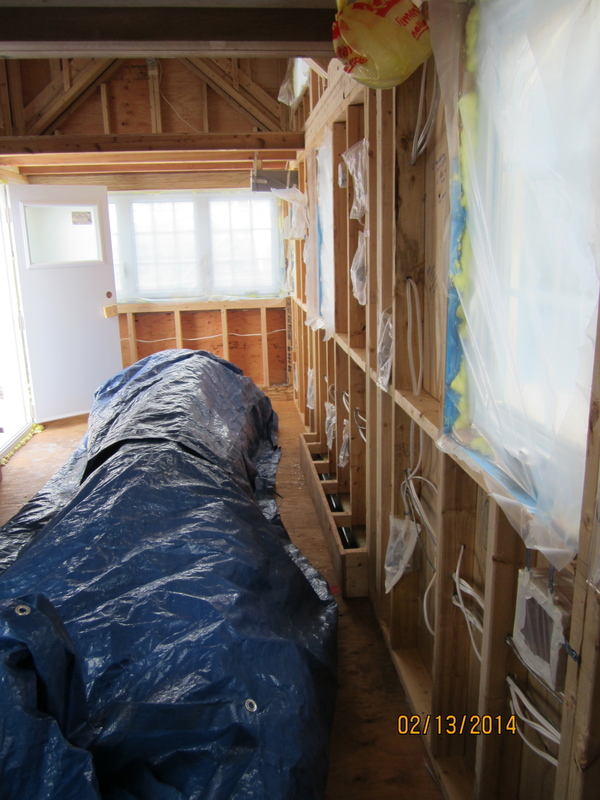 The big blue tarp is covering/protecting the interior siding that have to be stored inside the tiny house. 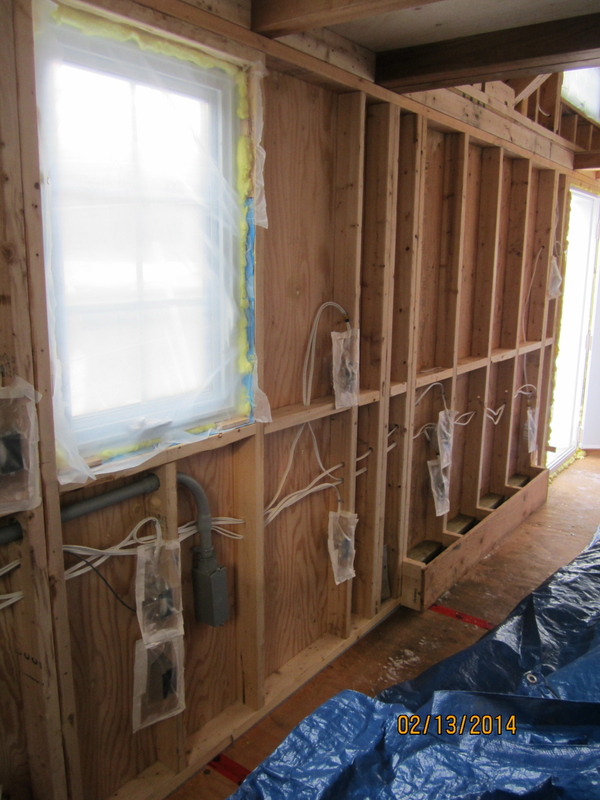 Electrical roughed in, ready for spray foam. Main loft electrical rough in. I chose to light the loft with two lights at the end of the loft and there will be 2 outlets on either side of both windows. 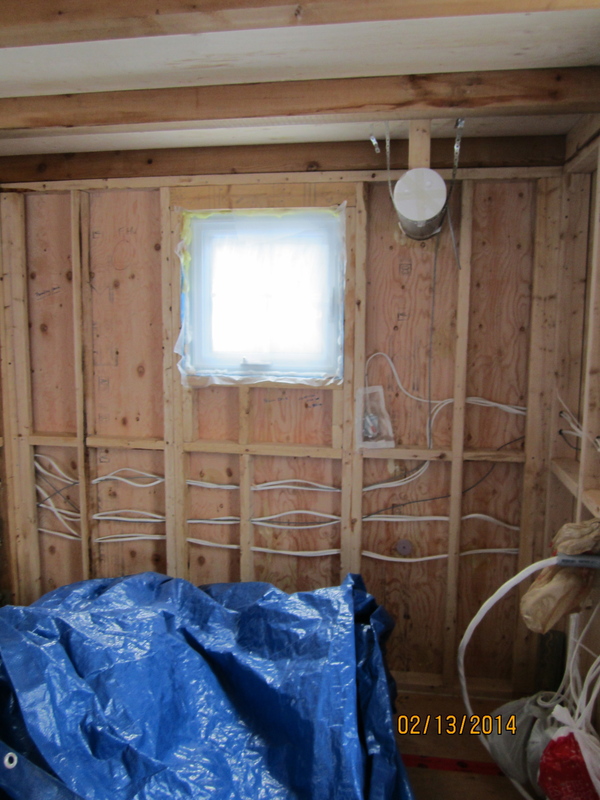 The bunch of wires on the lower right of the photo are all ready to go to the panel which will go into the wall dividing the bathroom from the kitchen – the only interior wall in the house. The grey tube in the top right of the photo is the housing for the HRV unit. The tube will be cut down to size later on. 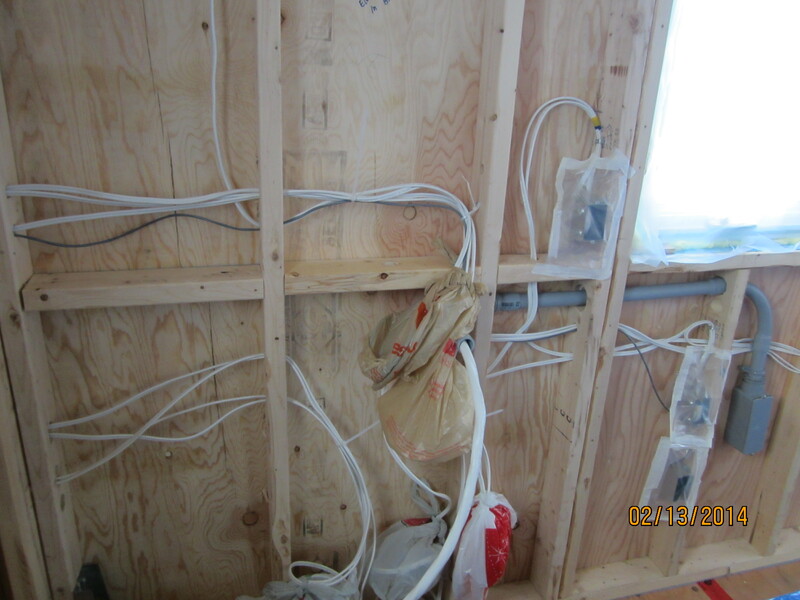 The grey box on the lower right of the photo is the new location for the electrical inlet. The conduit will make it easier to make any modifications to that inlet down the road if needed. 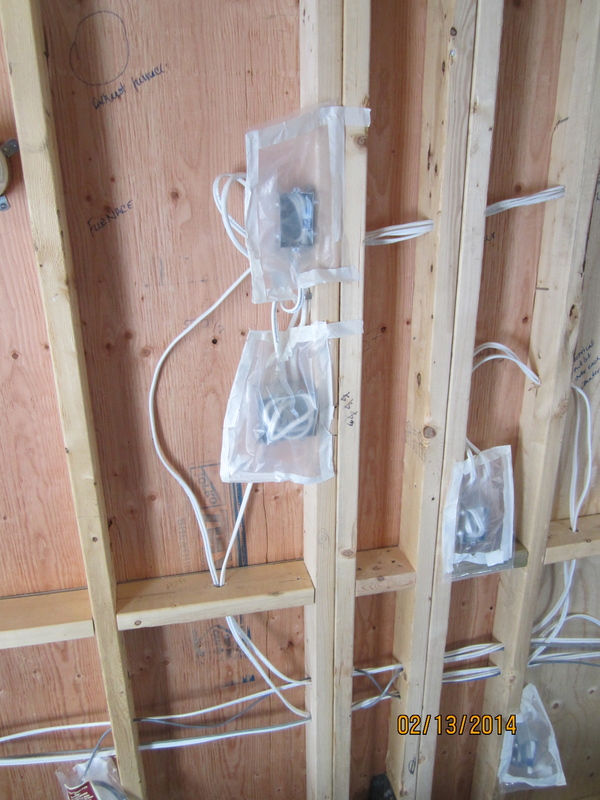 A close up of some of the wiring roughed in and ready for spray foam.